Some very, VERY, exciting news overnight with the announcement that registrations to attend IN PERSON at the World Premiere of the Domino V10 product family in Frankfurt on the 9th of October are now open! In addition, the site also enables customers who can attend the live event in Vienna on the 10th of October to register on the same site. Don't worry if you can't attend the event in person, we have announced the live streaming event HERE, so get ready to gather your mates and plan your own Domino V10 World Premiere Watch Party! 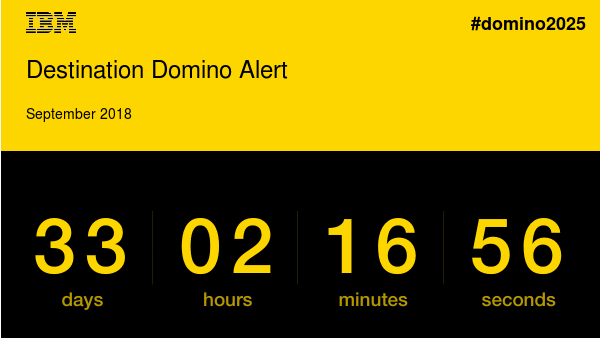 We are getting so close now, a new future for the Domino Product Family is imminent AND I CAN"T WAIT! If you haven't signed up for the announcement newsletters yet, here is your reminder to visit the Destination Domino site and sign up so you can get these first hand. If you cannot attend the 9th, there are multiple V10 launch meetings as of 10/10 around the world too. Wow, this blog is as outdatet and pre-2000 in case of technology, design and usability as domino/notes 9.